Somewhere deep in space, out beyond even the Delta Quadrant, just past a small moon, a little to the right of an abandoned artificial intelligence core, there's a tiny spacecraft. Within that spacecraft is the laboratory of the (self admitted) mad genius Doctor Ni! Out here in the darkness of space, Doctor Ni works tirelessly to bring an end to galactic hunger. Here to announce the Doctor's latest invention are his assistants, Danger Dave, Toxic Tina, and Gertie! 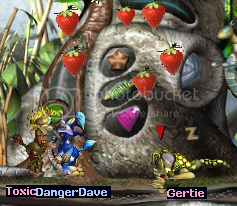 These strawberries have been extensively tested by the team, certified 100% non-toxic by Toxic Tina (she got better), nutritious by Danger Dave (he got attacked by Gertie), and Grendel friendly by Gertie (she slept though most of the testing). Final report: The strawberries are fruits that are a good source of Vitamin C and Anti-Oxidants, and also seem to have a mysterious calming effect on angry creatures. That's it for today's new product. Stay tuned for more fantastic foodstuffs from Doctor Ni and his trusty assistants. And here's the code, to hopefully inspire others to create patch pants of their own. *Here's the spawn script; it's the one that's going to create our fruit for us. new: simp 2 8 14901 "strawberry" 14 0 name "patch_plane"
*This is done just in case a tick equals zero. *our creatures can interect with it. *status keeps track of whether or not the strawberry is being held. *advance the pose by one. *or if it's pose is greater than 12, chnage it's attribute so that it can be picked up. *ov99 tracks how long our fruit has been in the world. *Set patch_id to 0 so that it doesn't continue to take up space on the patch. *Am I 50 ticks old and not being held? Time to die! *let the creature know it's eaten fruit. Last edited by The Second on Sun Apr 21, 2013 1:15 pm, edited 1 time in total. Omnomnom - these look great!